Emma Haughton is a freelance journalist who has written features for a wide variety of newspapers, including the Independent, and glossy magazines, such as Country Life. She is a mother of four. 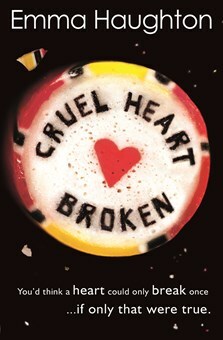 Cruel Heart Broken is her third YA novel, following acclaimed thrillers Now You See Me and Better Left Buried. My name is Laurie Riley, though close friends call me Lee. I’m fifteen years old; sixteen in August, three months from now. I live in Hove, the posh end of Brighton. I attend Hangleton High, and am about to take ten GCSEs. I’m hoping to do well – need to do well – because I’m going to be a doctor. I know this with a certainty that comes from desperation; it’s the only thing keeping me going. All I have left to hang on to. My chance to make amends. My family? Nothing out of the ordinary. Two parents, still together after twenty years. Mum a GP; Dad retired from the police force, now retraining in IT. A sister, Katy – also in my year at school though she’s eleven months older. And my brother, Walt. He’s seven, and exactly what you’d expect in a little brother: annoying, endearing, forever asking questions. I had two best friends, and now only one. Her name is Maya Patel. These are the facts of my life. Tack on the things people think they know about me. That I’m a good girl. The good sister. The quiet, easy-going one. Katy is all edges and sarcasm and slammed doors, and I’m sweetness and light and lots and lots of homework. This tells you nothing, of course. Perhaps all you really need to know is that eight months ago, my life changed for ever. Ice grew in my heart. Poison seeped into my blood. Nothing will ever be the same again. It is a secret. My secret. Really though, this isn’t my story at all. This story begins now, in the middle of our GCSEs, and it belongs to Charlie Forrest. What can I tell you about Charlie? I’ll start with his hair, because it’s the first thing people notice. It’s deep-brown and grows in crazy tight curls, standing up from his head like an electric shock. Along with his olive skin, he says it’s the only thing he ever got from his dad. Back when we were small, when the three of us – Charlie, Maya and me – all sat at the same table in the infant class, his hair fell in long corkscrews down his back. Most of his life Charlie wore it like that, tying it up for PE. But now it’s gone. Charlie cut it off. Turned up at school one day with it clipped back to a buzz. I don’t know why. It was around the time I became a murderer, and we pretty much stopped speaking to each other. About the time he got serious with my sister. And my cruel heart broke. You’d think, wouldn’t you, that a heart could only break once? If only that were true. Whenever I see Charlie mine cracks and splinters all over again. Like now, getting home from my history exam to find him sitting at our kitchen table, shoulders slumped, staring at the floor. A trap. An ambush, snaring me as always. “Hey, Lee.” He turns his head in my direction, but we’ve perfected the art of never quite looking at each other straight on. Blood pounds in my temples. My heart collapses into a dark star, devoid of warmth or light. Instantly that hot feeling behind my eyes, the one I get if ever I’m close to him. “Hi.” I keep my tone bright and even as I dump my rucksack on the table; heavy with books, it thunks hard against the wood. What’s he doing, I wonder, sitting alone in here? Shouldn’t he be upstairs with Katy? When the pair of them aren’t over at Charlie’s, they hide up in my sister’s bedroom. Most times I don’t even know he’s in the house unless we bump into each other on the landing. Once I emerged from the bathroom and found him right in front of me, hand reaching for the doorknob. Only a few centimetres between us. A knife in my guts. A lurch of something so pure, so piercing, I thought I might pass out. “How did the exam…?” Charlie stops as Katy walks in, carrying the medical kit Mum keeps in the utility room. My sister scowls when she sees me, putting the box on the table and removing one of the little medicated wipes in a foil packet. Why does she need that? It’s only as Charlie turns to face her that I notice; I’ve been so busy not looking at him that I missed it before. A gash across the side of his temple. About three centimetres long, oozing blood. Katy carries on pretending I’m not there, but Charlie manages a weak smile. Our eyes meet for a fraction of a second, before skittering away. “It’s nothing.” He tips his head back as my sister gently swabs the wound. A faint sharp smell of antiseptic fills the room. I watch, frowning. It looks a whole lot more than nothing. The surrounding flesh swollen, the colour already deepening to purple. Not a knife then. Something blunt bruised as well as split the skin. I glance at Katy. Does she know what happened? But my sister’s still blanking me. We may be pretty close in age, but that’s it. We’re worlds apart, Katy all blonde highlights and cheerleader looks. Me mousy and geeky. Utterly forgettable. too early for me to remember. But any affection we might once have had for each other has well and truly evaporated. I wish I knew why. I’ve tried talking to Katy a few times over the years, but all I get is a shrug. An eye roll. A look that says I’m a lost cause. My sister ignores me. Charlie glances over, then lets his eyes slide away again, like I make them hurt. As if on cue, Mum walks in, her thick brown hair pulled back into a clip, her face set in that tired, harassed expression it always has after seeing patients. She raises a hand in greeting as she pulls off her jacket. I catch her glancing at the half-finished bottle of red wine on the countertop, before turning her gaze to Charlie. He’s mustering another smile, but I can tell the effort hurts his head. Has Katy offered him any painkillers? “Okay, let’s take a look.” Mum drags out a chair and sits in front of him, observing the wound for a few moments before lifting her fingers to examine it more closely, careful not to touch the broken skin. Mum purses her lips, but doesn’t pursue it. “I was just cleaning it up.” Katy holds up the wipe, now smeared with streaks of red. I try not to think what it reminds me of as Mum takes it from her and dabs away more blood. “This is going to need stitches,” she says finally. “Can’t you do them?” he asks. My sister’s eyes widen. Her face takes on a dramatic expression. He blows out air between his lips, clearly not keen on either option. Not that he dislikes Mum or anything. Probably can’t handle a three-hour wait in the local hospital. “Charlie, you need to get that looked at. Seriously.” Mum’s voice has that my-word-is-final tone. He sighs. Gives in. “Okay. I’ll ring her.” He gets up and walks out to the garden, even though the low cloud that’s hung around all day has turned into a light summer drizzle. Not wanting to make the call in front of us, I guess. “How did it really happen?” Mum asks Katy the moment he’s gone. “Well, maybe they did.” Katy doesn’t so much as blink, but there’s something shifty in her manner. The way she presses her lips together, as if sealing in the truth. Then again, you can never tell with my sister. She goes through life acting like the most ordinary things are secret. Who her friends are. Where she’s going. What time she plans to come home. I’ve no clue why she does it. Maya says it’s because Katy’s such a drama queen, that she wants people to think she’s more interesting than she actually is. More likely she does it just to be difficult. Mum rubs her forehead in frustration, then gets up and pours herself a glass of wine. She seems exhausted. Clearly an afternoon of heart-sink patients. Possibly a practice meeting; it’s Mum’s job to work out the budgets. I glance at the first-aid stuff spread across the table. Look at Katy, but she just sits there, raking her fingers through her long fair hair and gazing absently at her phone. I see Mum’s frown of annoyance, but she doesn’t object. Letting Katy get away with it – again – lacking the energy for another confrontation. “I’ll clear up, shall I?” I say pointedly to Katy. I bite back the urge to argue. I can’t face it, especially in front of Charlie – or Mum, who shoots me a grateful smile as I stuff everything into the medical box and return it to the utility room. When I get back, Charlie’s come indoors, rain glistening on his hair. “She’ll be over in ten minutes,” he says, looking worse somehow. More shell-shocked. His eyes meet mine and, just for a second, they linger. I pick up my bag and retreat upstairs. I can’t handle this now, and no way do I want to bump into his mother again. Besides, this has nothing to do with me. What I feel doesn’t matter any more. This riveting read strikes the perfect balance between keeping you turning the pages and digging deeper into big issues that have big resonance... Tense, taut, and teeming with characters you’ll care about, this comes highly recommended for fans of thrillers with extra emotional depth. Emma Haughton is superb to read if you are looking for a thriller! Once you start this book, you won't be able to put it down. Impulsive decisions, toxic secrets and devastating consequences in a contemporary UK YA title that explores teen pregnancy and abortion. Never one to shy away from tough complex issues, Emma Haughton returns with another powerful and thought-provoking tale... Haughton’s heartbreaking story handles difficult themes with understanding, openness and sensitivity while delivering a compelling page-turning story packed with mystery, authentic characters and shocking discoveries. Emma Haughton’s writing style was fantastic. Everyone can easily dive into this book. I SIMPLY LOVED IT.